I just purchased one of the Fun and Done patterns. I was worried about how the blocks were put together. When you stitch the blocks together and fold the edges over the block and stitch down, how sturdy do you think the quilt will be using this technique? I wanted to do a baby quilt so it will be used alot and wash alot. I haven't done one of those but it's just quilt as you go style. I can't see that it would be any weaker. Maybe someone will chime in here. Stitch as you go is a common way of putting together a quilt. It should be strong enough for the washings. I have one that's been washed many times. It's still fine. I really like the first fun and done that looks like a string quilt. Do you need anything else other than the pattern to make it? I think the fun and done method would be sturdy enough for a baby quilt. I will say, however, that I had a very hard time aligning the squares with this method. It was the only quilt I've never completed. I gave up on doing the assembly her way. I zigzagged blocks together, put a narrow sashing strip on the back and a wider one on the front. I got tired of burning my fingers trying to iron the sashing from instructions. Quilt looks just the same on the front. I made a quilt using a Fun and Done as a inspiration. I didn't buy the Batting Buddy they sell, since the blocks that I wanted to make for a baby quiltwould be too large. So I went to the dollar store,bought some flexible cutting boards, and made my own templates. I also made my own pattern. It turned out lovely, I am planning on making more with this quilt as you go method. I didn't have any problem lining the blocks up as one poster here did. You make the backing larger than the pieced block and the batting. Then you sew the block together,then you turn down the seams twice and sew it down. As I said, it turned out lovely. I am considering using this method on my next quilt. The nice thing is, when you have the block sewn together and the seams sewn down, you're done! Try it, I think you might like it. Go to Bayside Quilting and look at the fun and done video to show you how it goes together. If sewn with the proper distance from folded edge, these quilts wash well. It is a quick method to get the job done and there is no need to machine quilt afterwards...it's already done! Enjoy making it and the recipient will love it! The fun and done are very sturdy! I made one of these recently. The seams are very strong and they should hold up well. The pattern tells you to adjust the stitch length (from 2.5 to 2.0) when joining the blocks together to add strength to that part of the quilt. The block buddy works great to get the precise size of the pieces. I made one and my seams are coming apart. You have only one seam holding the blocks togather and it is the backing fabric only. You need to shorten your stitch length and stitch as close as you can get to the blocks. This makes a stiff quilt also so will not make another one. I bought the rulers and the inside one is 7 1/2 in so it comes in handy when you need this odd size. I've done one and haven't had any problems. 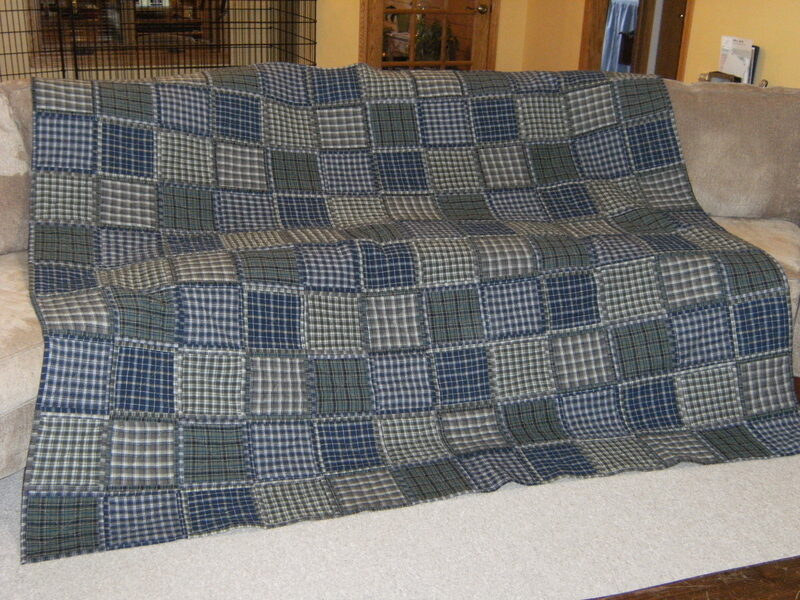 It was the first quilt I ever made. Tried the video on Fun and Done on Bayside as suggested and it wouldn't work on my Mac, just turned up all gibberish. Why? When I clicked the link at Bayside it opened up "Windows Media Player" to view it. I'm guessing that is the default viewer built into that video. I remember searching for a long time for other tutes on it and did again just now, but can't find any. I use this technique to do wall hangings from embroidery. i design my own embroidery with embird and use a loose line drawing instead of a dense embroidery. i take a backing fabric and hoop it and then take a sandwich of thin batting (normall polar fleece) and my top fabric, spray adhere the batting and top, then cut to 4 or 5 or whatever size i want - don't need to be square, rectangular shapes also work fine. then spray the back of the batting and place on the hooped backing. then to the embroidery machine and stitch through all 3 layers. if i use a light color on the front i use a dark thread on top and a dark on the back use a light thread. the back and front both get embroidered at the same time. normally i use a solid top and backing. once each square is done, you can trim the edges to 1 inch, sew together - i use my zipper foot to sew these together as i can get right up to the edge of the sandwich without the foot riding on the sandwich, turn and sew as done in the video. if i want a lighter or more interesting design, i will take my serger and serve a contracting color thread around all 4 edges of the backing after it has been trimmed, then fold over only once and top stitch with the same color thread which makes the machine sewing disappear in the serged thread. that puts a color border around each square. you can control how heavy the quilt is by the batting you add and whether you use 1 or 2 thicknesses in the turn over to each block. I made a quilt for our bed out of crumb blocks in the fun and done method. It has held up fine. No troubles putting it together, either. Since I used a new sheet for the back of the blocks, it will probably last forever. I've made a couple of wall hangings / table runners / placemats / pot holders using the COTTON THEORY method (very similar to Fun & Done and the Quilt-As-You-Go). They are VERY STURDY (and the kitchen items get LOTS of washing due to my 8 & 9 year olds). They have held up quite well and were very fun to sew. Can someone post the link??? I went to the Bayside site and could not find any videos. I searched also and it turned up nothing. I must be doing something wrong???? Unless you are helping them up!! This is the URL from The Bayside site. https://www.baysidequilting.com/stor...idCategory=284 There are also some youtube videos showing the method done by other quilters. There are many methods of QAYG. There is a thread on this site that I subscribe to, but I haven't tried the methods yet. If you search QAYG you will find many.